Click on the picture above to read all about the ancient villages of Derwent and Ashopton and how they were drowned in the 1930s when Ladybower Reservoir was created. Their secret streets re-emerged from a watery silence after the dry summer of 2018, and they tell a fascinating story. 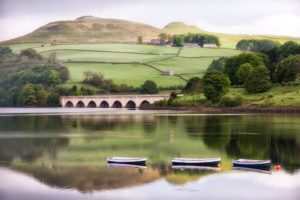 The accompanying video is below, all shot on location at Ladybower Reservoir and the ruins of Derwent. 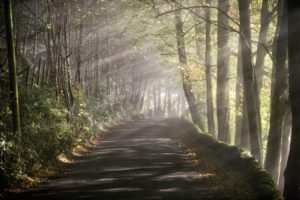 Click on the picture above to read all about Eyam, whose pretty lanes hide a rather grisly history from 1665, when the Plague came to the village. The villagers quarantined themselves from the rest of the world, and saved the lives of thousands of their neighbours. The accompanying video is below, all shot on location in and around Eyam. 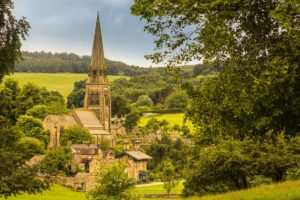 Click on the picture above to read all about Edensor, the ancient village along the River Derwent that was dismantled, moved and rebuilt by the Duke of Devonshire in 1838 – just so that it couldn’t be seen from Chatsworth House and spoil the view of the parkland. The accompanying video is below, all shot on location in and around Edensor and Chatsworth House. Click on the picture above to read all about Rowtor Rocks, a mystical cave complex carved in the 17th Century by the local parson, who was also a practising Druid. 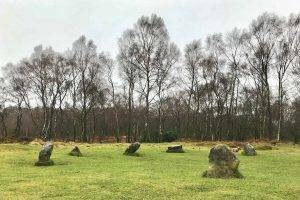 Not far away is the mysterious Nine Ladies Stone Circle, a Bronze Age monument on Stanton Moor. The accompany video is below, all shot on location at Rowtor Rocks and the Nine Ladies Stone Circle. In March we revisited Ladybower Reservoir after a wet winter to see how the water levels had risen. We found that the ruined village of Derwent had once again slipped beneath the waters, the Derwent Dam was in full flow, and the plugholes were overflowing too. 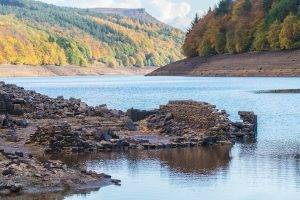 The video below, all shot on location at Ladybower, shows how the rains have transformed the landscape.